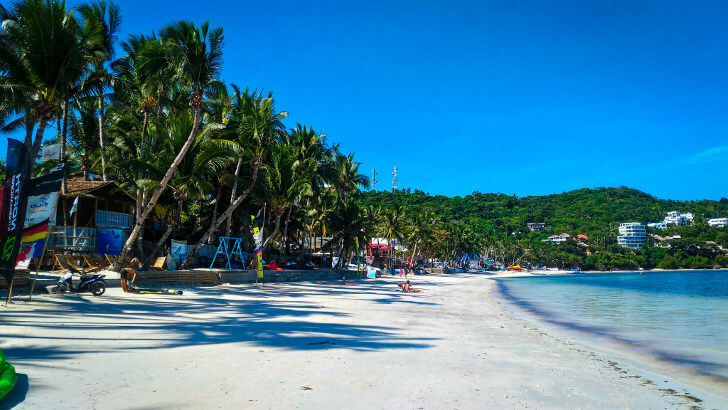 Bulabog Beach is the second longest beach on Boracay and is located right opposite the famous White Beach on the other side of the island. Compared to White Beach, the Bulabog Beach is more quiet and there are not as many shops and hotels on that side of the island. You'll also not find as many swimmers in the water. That's because Bulabog Beach has a long and wide but shallow lagune and a continious strong wind from the east is blowing on shore. That's why Bulabog Beach is the beach for the Kite Surfer and Wind Surfers. Sometimes hundrets of them using the lagune for their sport at the same time. From time to time even international Kite Surfing Competitions are being held at Boracay Island. Hotels at Bulabog Beach are usually a bit cheaper than on White Beach and as I said, there are not as many either. Evenings are also quiet here but you can easily walk over to the White Beach which is just about 600 meters away.